A marathon lover turned triathlete, I love long distance races. I resigned from my corporate job as a chemist for 16 years to coach and personal train full time. 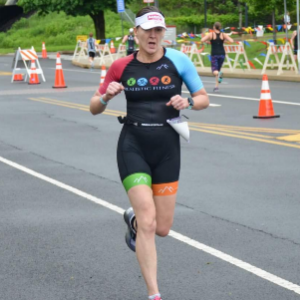 In addition to on line coaching, I coach in person run groups (5k and half marathon), triathlon clinics, swim clinics and more. I love working with the beginner who is eager to learn as well as the advanced athlete who wants to be challenged. I am my athlete's biggest cheerleader. Remote online coaching unique to the individual athlete with unlimited access to coach through texting, email, phone calls. Coach runners and triathletes of all abilities ensuring the schedule meets the demands of the athlete's busy life. Schedules are built week to week to ensure athlete is progressing safely and effectively. Also available for 1:1 in person sessions for local athletes. Athlete must have a device compatible with TrainingPeaks and a heart rate monitor. Success. Coach Denise Terry has been notified of your message.